Compiled by: Karl Grebe, Patrick Siiyatan. Series edited by: Roger M. Blench. 12 pp. Roman, 825 pp. Lamnso’ is the language spoken by the Nso’ people of Bui Division in the North West Region of the Republic of Cameroon. 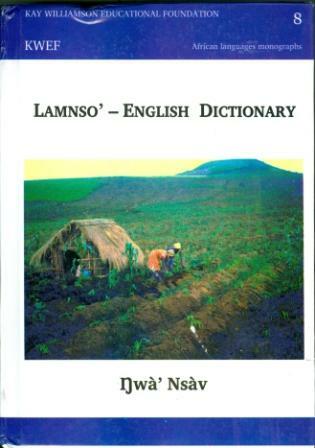 Lamnso’ literally means “language of the Nso’ people“. It is a Grassfields Bantu language belonging to the East Ring Group of Narrow Grassfield languages. 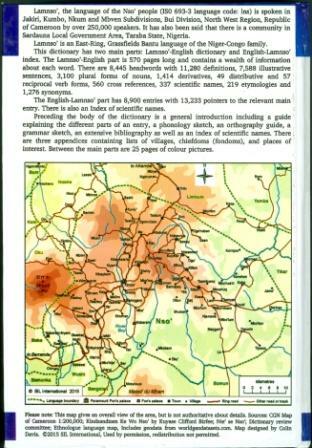 According to the SIL Ethnologue there are about 240.000 speakers of Lamnso’ (Lewis et al. 2015), most of whom live in the traditional Nso’ chiefdom which is part of Bui Division. There is also a significant number of Nso’ people living in Taraba State in Nigeria. This work is the result of data collected by Karl and Winnie Grebe over a period of fifteen years. It needs to be recognised that this dictionary presents a first attempt to compile a significant corpus of Lamnso’ vocabulary items and to define them grammatically, semantically and derivationally, as well as to illustrate their use in context. The development of Lamnso’ as a written language began in the 1940’s when Nso’ schoolteachers undertook on their own initiative to write Lamnso’ in order to teach primary school pupils in their own language before advancing to English. It is hoped that, in spite of its imperfections and limitations, this dictionary and the grammar sketch will serve to advance the use of Lamnso' as a written language. This book edition is being sold in commission by our publishing house. The copies were printed in Cameroon in 2015 and may exhibit a bad printing quality, as well as transport and storage damages.